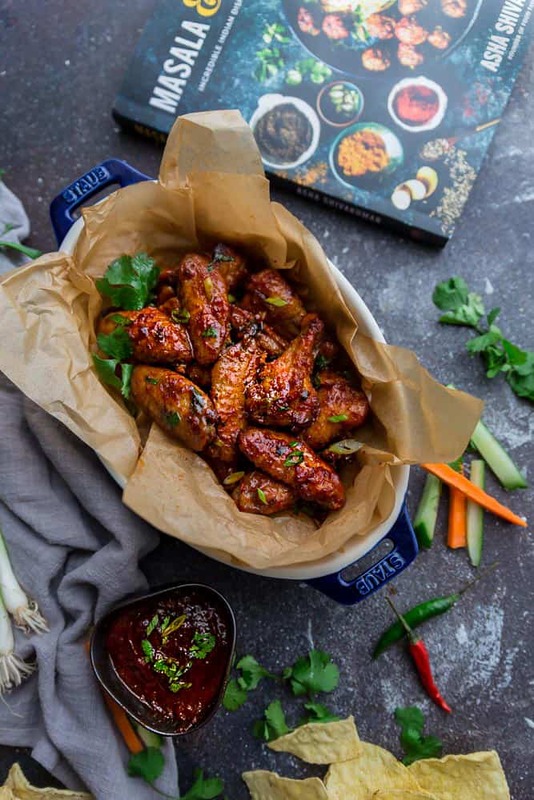 Masala Chicken Wings – these crispy baked wings are full of flavor and the perfect spicy game day appetizers. Happy Super Bowl Sunday! It’s the big game today and even though I’m not really into watching the game, you can’t beat all the awesome food that goes along with it. 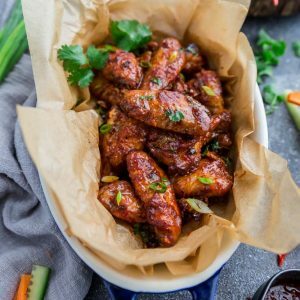 Wings are my husband’s absolute favorite so I’m always on the hunt to try new and exciting wing recipes. 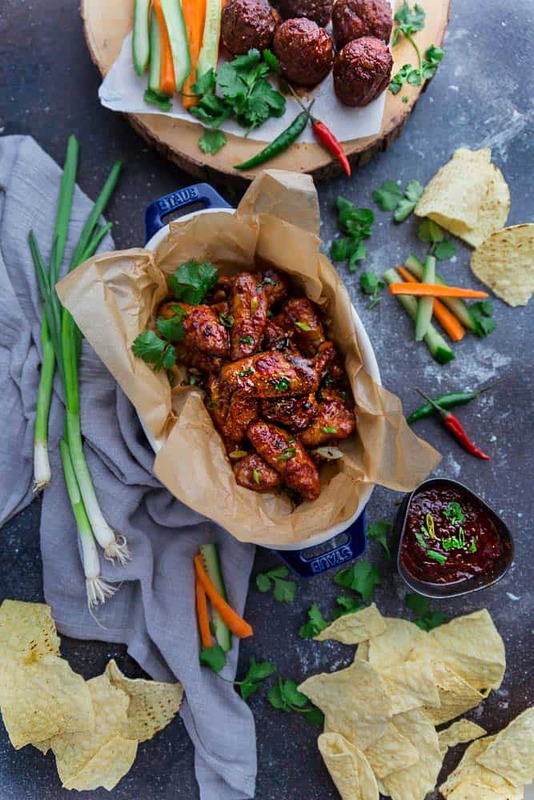 These flavor-packed Masala Chicken Wings are from my friend, Asha’s amazing new cookbook, Masala and Meatballs. 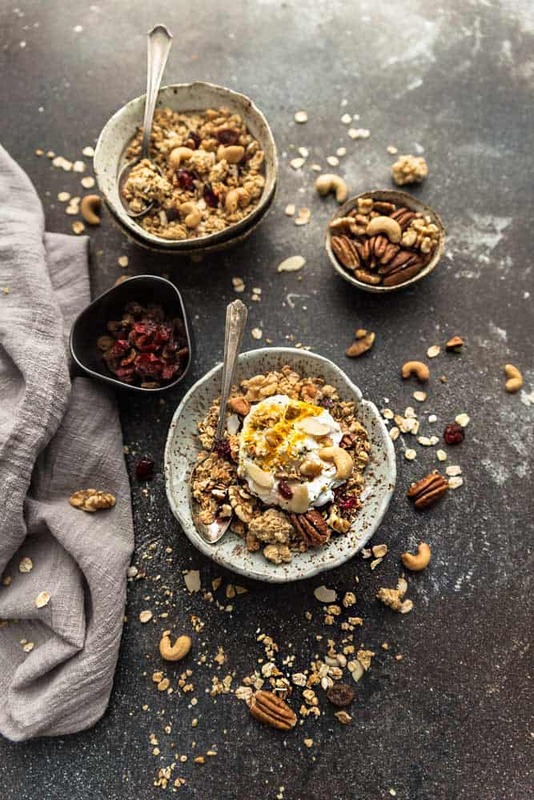 Asha is the talented writer and photographer behind Food Fashion Party. She is a total sweetheart and all of her gorgeous photos on Instagram are sure to make you instantly hungry. I couldn’t be more excited for the launch of her new cookbook and seriously had such a hard time choosing which recipes to make first. 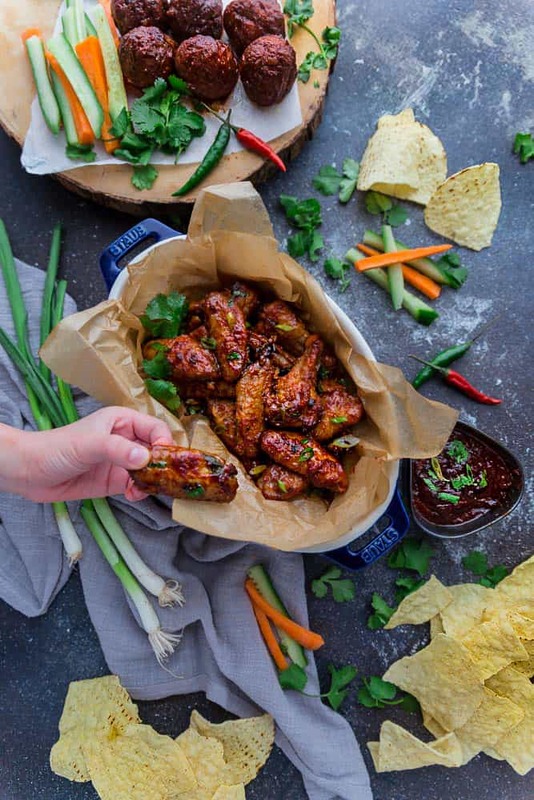 So far, we’ve made the yummy coconut cardamom granola, chicken meatballs and today I’m sharing the recipe for these amazing Masala Chicken Wings. You’re going to start off by marinating the wings in a mix of low sodium soy sauce and ginger garlic paste for at least two hours or overnight. For a gluten free alternative, we used GF Tamari but you can also use Coconut Aminos as well for a paleo option. 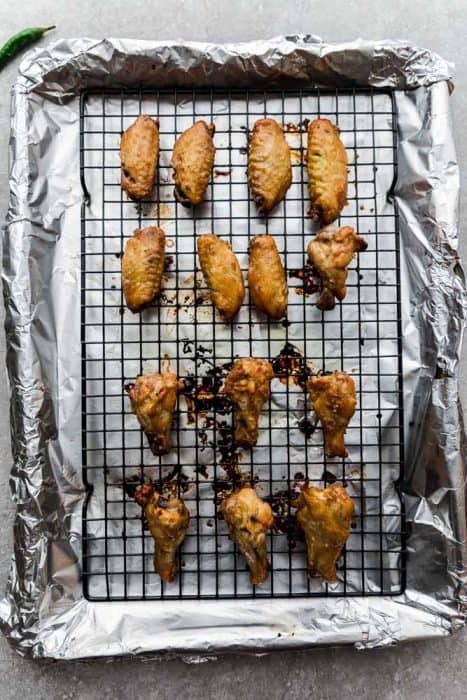 Next, you’re going to bake the wings over a lined baking sheet over top a wired baking rack. This ensures the wings cook up evenly and perfectly crisp. While the wings are baking, you’re going to make the sauce in a saute pan over low heat. The delicious sauce is a combination of garam masala, garlic, green chilies, soy sauce, chili sauce, ketchup and fresh pineapple or orange juice. 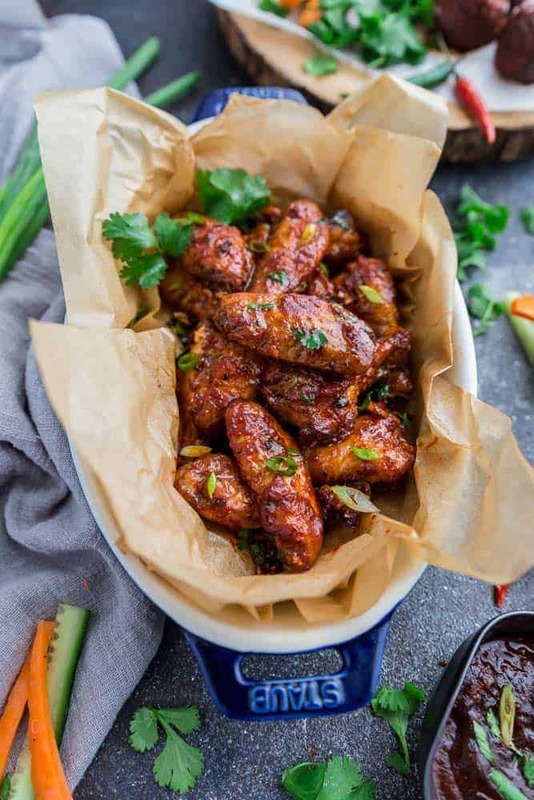 Once the wings are cooked, toss and coat well with hot sauce and serve with chopped green onions and cilantro. If you’ve always wanted to learn how to make Indian recipes, Asha’s book is the perfect place to start! She’s included classics to suit the American palate and the photography is simply stunning. You can find Masala and Meatballs at Amazon, Barnes and Noble, or wherever books are sold. It’s a must for any food lover’s book collection! Combine the soy sauce and ginger garlic paste in a large zip-top bag. Add the chicken, seal the bag, then shake and squeeze until coated well. Place in the refrigerator to marinate for at least 2 hours, or overnight. Preheat the oven to 400 F degrees. Line a large baking sheet with aluminum foil wrap (or parchment paper) and top with a wire cooling rack. Arrange the marinated wings in a single layer on the rack. Bake in preheated oven for 25-30 minutes, or until cooked through and crispy. You can baste the chicken with the marinade once during the baking process. Meanwhile, make the sauce while the chicken is baking. 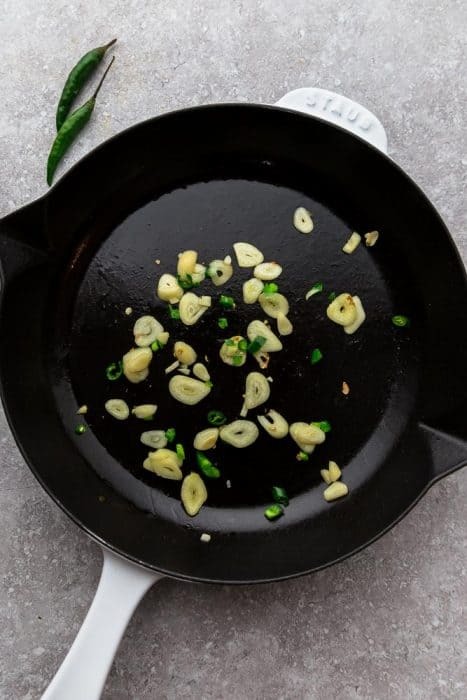 Heat the oil in a saute pan over very low heat. Add the sliced garlic and green chilies. Fry for 2 minutes, or until fragrant. Stir in the garam masala, soy sauce, chili sauce, and ketchup. In a small cup, whisk together the pineapple or orange juice with cornstarch, until smooth. Add it to the pan while whisking continuously. Once the sauce thickens and has a good consistency, turn off the heat. Taste and add salt, as needed. Add the ground pepper and green onions. Add the cooked chicken to the pan while the sauce is still hot and toss well. Serve immediately, sprinkled with chopped cilantro.